It’s Holy Week on WELSTech, and the discussion centers around the why, what, and how of building school intranets. But the tech-in-ministry goodness doesn’t stop there. 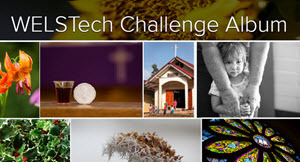 We have Easter images, WELS on your desktop, a projection worship discussion, a musical devotion Facebook Watch Party, and embedded audio on Google Slides to share as well. Enjoy! Build a School Intranet with Google – The Let’s Build an Intranet series turns to privatizing, organizing, and collaborating on school information, and Martin and Sallie share ideas for building in the Google space. Reference the how-to video on Episode 588 for additional tips and demonstration of building these solutions. WELS Education, Technology, and Leadership Summit attendees may win one of 40+ amazing giveaways! How do I create a Watch Party on Facebook? and Koiné’s Lily Mini Movie. Episode 597 – Kristen Knickelbein shares a preview of her #EdTechLead19 sectional titled Hack Outreach: Summer STEM+ Camp. Release date: Wednesday, March 24.